12-Mar-2019 - DiskSorter v11.7 adds the ability to display timeline charts showing the amount of disk space and the number of files per creation, last modification and last access year. In addition, the new product version adds the ability to export all types of pie charts and timeline charts to the BMP, JPEG and PNG image formats. Finally, the new version improves the main DiskSorter GUI application and fixes a number of bugs. 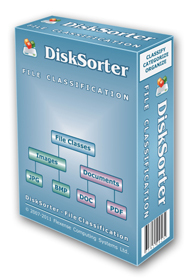 17-Jan-2019 - DiskSorter v11.5 adds the ability to display the top 100 recently created or modified files sorted by the file size and the top 100 old, unused files sorted by the file size. In addition, the new product version adds the ability to filter file classification results by files contents using regular expressions, improves the main DiskSorter GUI application and fixes a number of bugs.